There are lots of reasons September is one of the best months to visit Hawaii—great weather, fewer visitors, cheaper flights. But, for many locals and visitors, September shines for one reason: The Aloha Festivals. The Aloha Festivals started in 1946, as a way to share the culture of Hawaii (it used to be called Aloha Week). And, over the last six decades, it’s grown in scope and vision to become one of the biggest events of the year, celebrating Hawaii through music, dance, cuisine, and art. In 1991, Aloha Week became the Aloha Festivals, and now includes about 300 events spread-out over six islands. In essence, the Aloha Festivals event is an enormous block party with one purpose in mind: spread the aloha! The Aloha Festivals event starts out with the introduction of a “Royal Court,” held on Oahu on the grounds of Helumoa, which was originally the home of Princess Bernice Pauahi Bishop. At the ceremony, the king, queen, prince and princess take their place on the royal court. The Alii court members receive their royal cloaks, helmets, head feather lei and other symbols of their reign. Traditional hula and chants make this a special event in the heart of Waikiki. You can see the "alii" during the Floral Parade, as they ride in their colorful clothes. This year, the 63rd Annual Hoolaulea will be held on September 19th from 7:00-9:00 p.m. on Kalakaua Avenue in Waikiki. There, you can join the thousands of people who are enjoying the food, fun and entertainment, Hawaii-style. Look for performances by the various genres of Hawaiian music and hula halau (hula schools). Hawaiian crafts and flower leis and many varieties of island cuisine will be featured throughout the event. 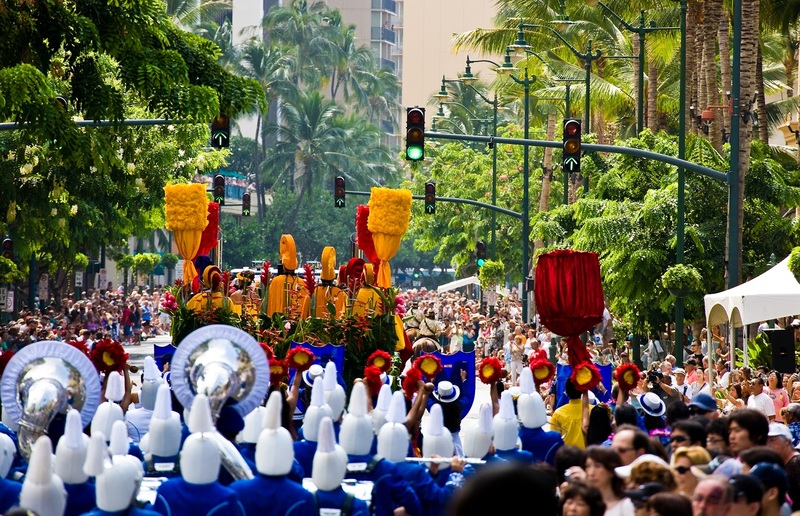 Just a week later, get ready for the 69th Annual Floral Parade on September 26th from 9:00 a.m. to 12:00 p.m. from Ala Moana Park through Kalakaua Ave. to Kapiolani Park. 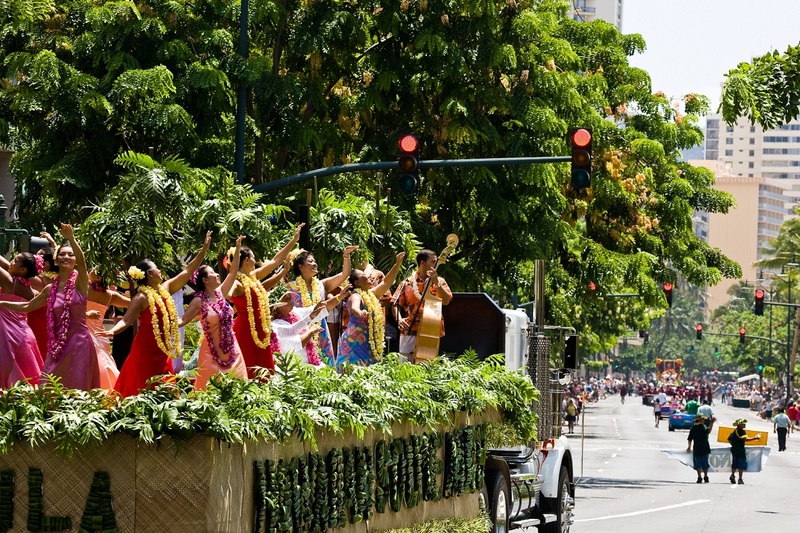 Watch, as Kalakaua Avenue comes alive with a colorful procession of female and male pau horseback riders, floats covered with Hawaiian flowers, Hawaiian music, hula halau and local marching bands. Hula is as large part of the Aloha Festivals celebration, as many hula halaus perform during the Floral Parade. If you have little-ones in tow, consider attending the 12th Annual Aloha Festivals Keiki Hoolaulea Saturday and Sunday, September 12th and 13th Pearlridge Center. There, you and your keiki (children) can celebrate the Aloha Festivals event with two days of free activities, demonstrations, arts and crafts and continuous stage performances. Each year, the Aloha Festivals organizers decide on a theme. This year’s theme is HULU ALOHA,”Beloved Feather Treasures,” recognizing the tradition and mastery of feather works of Hawaii. During the Royal Court procession, look for the kahili (feather standard), cloaks ([haw]ahuula), helmet (mahiole), and lei. They are all treasured works of art that distinguished the Aliʻi (ruling class) of the Hawaiian Kingdom. In perpetuating the pageantry and magnificence of the Alii, each year the Aloha Festivals Royal Court is attired in recreated symbols of rank. All events are free and open to the public. For more information, visit www.alohafestivals.com. If you’re lucky enough to plan your visit during September, you won’t want to miss this extraordinary annual event. It’s a great way to learn about Hawaii’s food, art, and music—and a wonderful way to share in the AlohaSpirit.